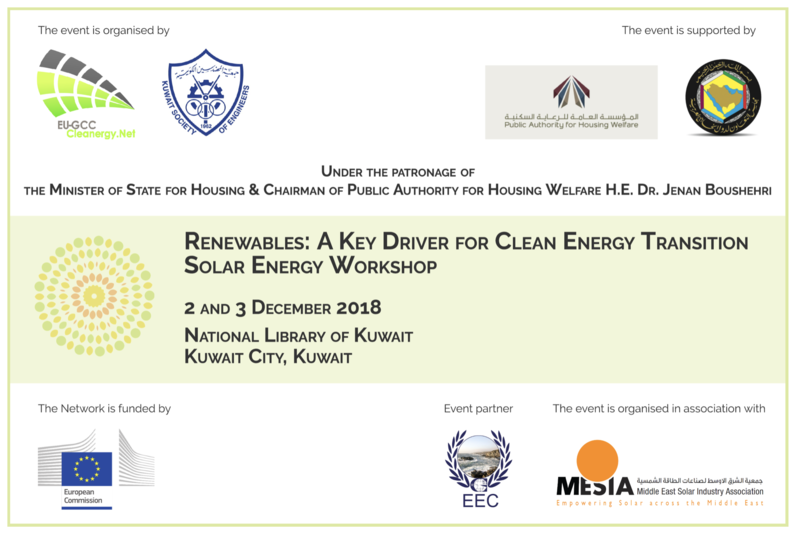 The EU-GCC Clean Energy Technology Network in partnership with the Kuwait Society of Engineers is organising the Workshop “Renewables: A Key Driver for Clean Energy Transition” with focus on Solar Energy Technologies on 2-3 December 2018, in Kuwait city. The two day workshop is under the patronage of the Minister of State for Housing and Chairman of Public Authority for Housing Welfare H.E. Dr. Jenan Boushehri and is organised with the support of the Public Authority for Housing Welfare and in association with Middle East Solar Industry Association (MESIA). The event will take place at the National Library of Kuwait. The aim of the experts workshop is to foster partnerships by bringing together high-level stakeholders from the EU (European Union) and the GCC (Gulf Cooperation Council) to discuss Solar Energy technologies and options suitable for the region, exchange best practices and lesson learned and advance collaboration between EU and GCC actors. The two-day workshop will bring together policy makers, project developers, financial institution, technology leaders, industry advisories, financial experts, government representatives, and entrepreneurs to debate the key challenges and opportunities in solar energy segment in policies, engineering, technology advancement and business models. The shift toward clean, reliable, affordable electricity in the world is most visible in the rapid proliferation of solar energy projects. Utilities, individuals and businesses have been attracted not just to the environmental benefits of solar power, but also to the ability to generate their own power and to the fixed and competitive price of electricity that these systems provide. Solar energy is increasingly cost-effective for the utilities, homeowners, business owners, and their communities. Dropping prices are due to economies of scale and technological advances. The falling price of solar systems results from improvements in the technology and economies of scale among manufacturers. On the other hand, because solar energy systems can be installed in cities, towns and remote areas, it offers job possibilities for local engineers and technicians. Unlike the fossil fuels, solar panels generate electricity with no air or carbon pollution, no ash or other waste products, and no inputs other than sunlight.